According to a report in Automotive Nudes, Volkswagen has denied the allegations of the EPA’s latest Notice of Violation, which claims that the 3-liter V6 TDI engine found in the Touareg and several Audi models uses the same “cheat” mode as the four-cylinder engines. Meanwhile, Porsche said they were “surprised” that the Cayenne TDI, which uses the 3.0 liter TDI engine, was named as non-compliant by the EPA. The diesel community, already reeling from the low 14:1 compression ratio in Mazda’s new Skyactiv-D diesel, were absolutely gob-smacked when Mazda announced that they are developing a new ultra-low compression diesel engine. The new Skymaster-Z engine uses an 8.5:1 compression ratio, so low that it requires an auxiliary electrical spark system in order to maintain combustion, and requires fuel that is more volatile than standard low-sulfer diesel. 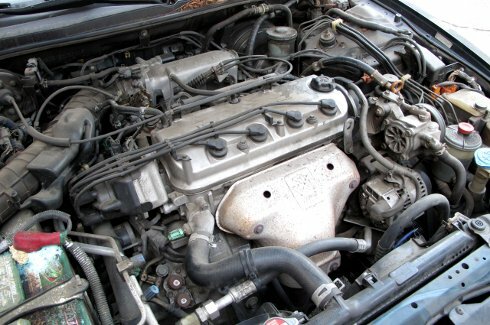 Mazda engineers have calibrated the engine to run on ordinary 87-octane gasoline, but this requires retimed single-pulse injectors and a more complicated intake system that premixes the fuel and air in a relatively constant ratio, as opposed to the variable mixture and power-cycle injection used by traditional diesels. Diesel nuts who worry about this sort of thing have expressed concern about the lack of upper-cylinder lubrucation due to the engines’ rapid combustion and reduced fuel stratification, but Nakahonda is confident the Skymassive-F engine will achieve a 180,000 mile service life. Mazda plans to offer the Skymackerel-Q engine in its popular Mazda3 compact, offsetting its additional cost by making the interior even cheaper and crappier.